Why study drug use and addiction? 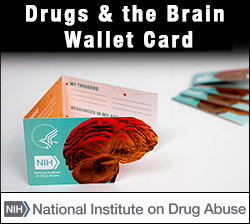 Adults who use drugs can have problems thinking clearly, remembering, and paying attention. They may develop poor social behaviors as a result of their drug use, and their work performance and personal relationships suffer. Babies exposed to drugs in the womb may be born premature and underweight. This exposure can slow the child's ability to learn and affect behavior later in life.10 They may also become dependent on opioids or other drugs used by the mother during pregnancy, a condition called neonatal abstinence syndrome (NAS). How does science provide solutions for drug use and addiction? Scientists study the effects drugs have on the brain and behavior. They use this information to develop programs for preventing drug use and for helping people recover from addiction. Further research helps transfer these ideas into practice in the community. The consequences of drug use are vast and varied and affect people of all ages.